1. The coefficient of the kinetic friction between block and floor (μk) is 0.5. What is the displacement of an object (s)? Acceleration due to gravity is 10 m/s2. If block on the horizontal plane then the normal force (N) =weight (w) = 40 Newton. If block on the horizontal plane then the normal force (N) = weight (w) = 40 Newton. Wanted : displacement of object (d) ? The work-mechanical energy principle states that work (W) done by the nonconservative force is the same as the change of the mechanical energy of an object. The change of mechanical energy = the final mechanical energy – the initial mechanical energy. The kinetic friction force is one of the nonconservative forces and the only one nonconservative force that acts on the block. 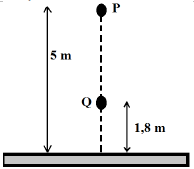 Object moves along the horizontal plane and no change of height (Δh = 0) so there is no change of the gravitational potential energy (ΔPE = PE2 – PE1 = 0). Thus the change of the mechanical energy just involves the change of the kinetic energy. 2. Object A and object B have the same mass. 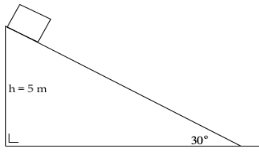 Object A free fall from a height of h meters and object B free fall from a height of 2h meters. If object A hits the ground at v m/s, then what is the kinetic energy of the object B when it hits the ground. The initial mechanical energy of object B = the gravitational potential energy = m g h.
The final mechanical energy of object B = the kinetic energy = ½ m v2. Because m g h = ½ m v2 then we can change m g h in equation 1 with ½ m v2. 3. An object free fall from a height of 20 meters. Acceleration due to gravity is 10 m/s. What is the velocity of object 15 meters above the ground? The kinetic energy at point 2 = the change of the gravitational potential energy as far as 5 meters. 4. A block is released from the top of the smooth inclined plane. What is the velocity of the block when hits the ground? The principle of conservation of mechanical energy, states that the initial mechanical energy = the final mechanical energy. A block with mass of m-kg released from a height of h meters above the ground, as shown in figure below. Determine the ratio of the potential energy to the kinetic energy (KE) at point M.